Tagline: You have the right to remain silent forever…..Again! Jason Lives! 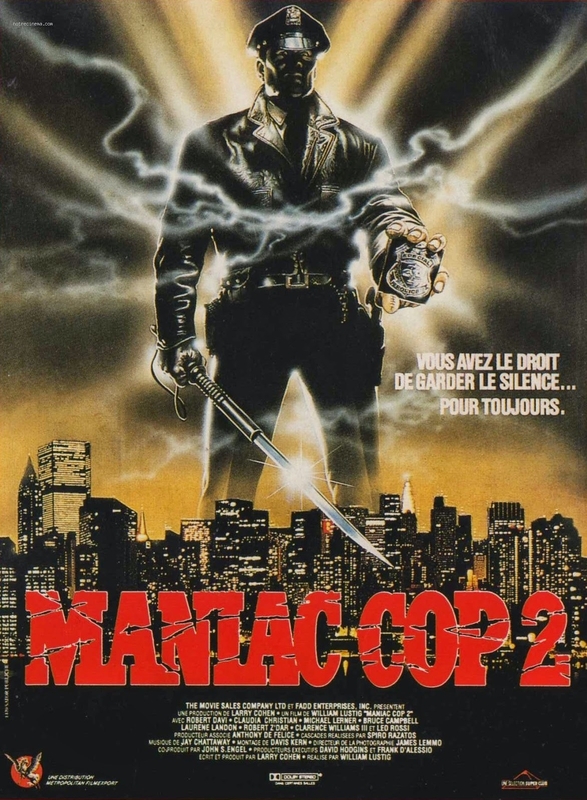 may have revitalised the slasher genre with its censor-defying brand of meta humour, but William Lustig’s Maniac Cop 2 elevated it to a whole new level. Robert Z’ Dar’s Matt Cordell is perhaps the genre’s most underappreciated seek-and-destroy killer, an irrepressible force who in 1988‘s Maniac Cop returned to enact vengeance on those city officials who had wronged him, and anyone else who happened to get in his way. Cordell was a zombified brute who would careen off a New York dock to his seeming demise. But there was no way this character was going to be put to rest so easily. He simply had too much potential. Give me a pack of Skittles! So good is Lustig and Cohen’s second slasher collaboration that, for me, it far surpasses the first movie. It may not have the grainy charm of its predecessor, but it thunders on at a remorseless pace, upping both the violence and the satire and giving us the most brutal killing spree in all of slasher cinema with a record-breaking 33 kills in a single movie, many of them falling to the kind of cop station massacre that makes Arnold Schwarzenegger’s T-800 look like a fairy struck down with the flu. Once again Z’Dar’s brutal creation is back with a vengeance, wielding chainsaws and snapping necks in a relentless siege on New York City’s grimy underbelly. With Tom Atkins’ whisky-swilling Frank McCrae long gone and the surviving cast quickly laid to waste with a Hitchcockian swiftness, the movie recruits another 80s legend to walk the preposterous path of correctional duty. Robert Davi plays Detective Sean McKinney, a noirish cynic who takes the roll of impossibly dismissive cop to a whole new level. That is until soon-to-be main squeeze officer Susan Riley has a particularly brutal run-in with our eponymous maniac, resulting in one of the movie’s stand-out scenes. Cordell stars in an ad for popular children’s board game, Guess Who? From the film’s hyperbolic opening you know you’re in for something quite special. This a relentless exercise in the absurd, with a plethora of heady quirks that turn a potential retread into a carnival of brutal insanity. One of those quirks comes in the form of serial killer Turkell (Leo Rossi) who during a spate of murders somehow becomes friends with our mute psycho, a bizarre dynamic which would never have crossed the minds of most writers, but which works wonderfully in way that will delight fans of Cohen. Turkell has a taste for lap dancers and strikes a peculiar bond with Cordell, who plans to take his vengeance streak even further by seeking retribution on those prison thugs who scarred his face and left him for dead. “The key to the Maniac Cop films is the actors don’t know they’re in a comedy,” Lustig would explain. “Everybody’s gotta play it straight, but what’s going on around them is ridiculous. That’s how I’ve always looked at the Maniac Cop films. They’ve got to play it with gravitas, and Robert Davi is perfect for that.” It’s a wonderful concept, and with the likes of Lustig and Cohen steering the ship, it is a concept that is played to the exquisite hilt. Add to this an antagonist like Cordell and the sky’s the limit. Wrestler Mick Foley would audition for the part of serial killer, Turkell. I, for one, would have to agree. After a high speed chase involving Susan and Teresa, Cordell handcuffs the former to a tireless car and sends her careening along the highway. Seeing an opening, Teresa then attacks Cordell with a chainsaw, only for him to grab the weapon full throttle and throw it to the ground without suffering even a scratch. With Teresa now at our monster’s mercy, he grips her by the throat, brutally snapping her neck and throwing her lifeless body to the ground like a rag doll. Talk about setting the tone in the first 5 minutes! After a no good junkie holds up a convenience store, Matt Cordell appears on the scene, but instead of helping the store owner he uses the junkie’s gun to blow him away. Afterwards, he hands the murder weapon to the junkie and slips out the back, framing the thief and leaving him at the mercy of the arriving cops. Surrendering to the police, the junkie is then pumped with a barrage of rounds, dancing around for an eternity before finally being blown ten feet through a plate glass window. In a delicious nod to James Cameron’s The Terminator, Cordell storms a police station, blowing away an entire fleet of cops during target practice. Walking through walls as if they’re not there, he then machine guns another two dozen cops to death, before sending the captain flying thirty feet across the room through three consecutive wooden beams and windows. Arnie wouldn’t stand a chance. Strolling through the graveyard with main squeeze Susan following Cordell’s funereal, the lovably cynical Detective McKinney offers a wry commentary on police brutality. Detective Sean McKinney: There’s a piece of Cordell in every cop, every time arresting some mutt isn’t enough. Because we know they’ll be back on the streets before we even do the paperwork. Every time we pull a trigger and it feels good, because no lawyers can reverse that. It all comes down to justice and pressure. There’s only that much difference between a cop and a maniac cop. 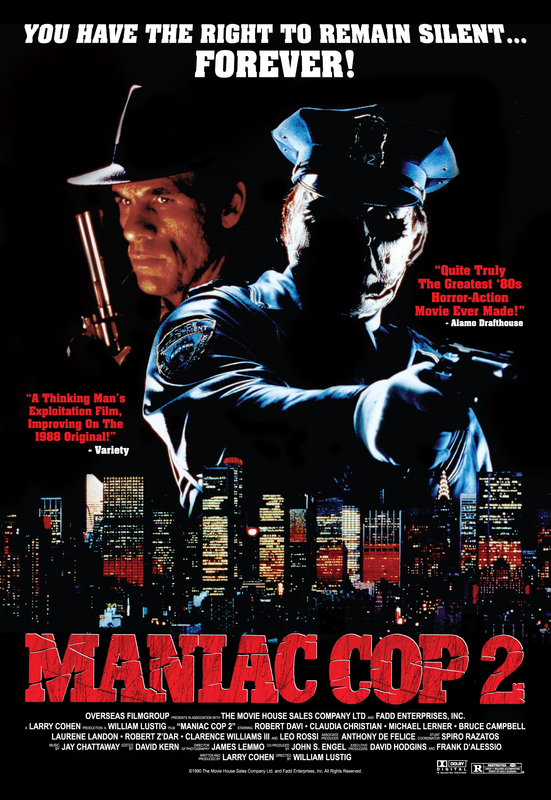 Aliens, Terminator 2, and now William Lustig’s Maniac Cop 2, this is one of those rare sequels that arguably tops its antecedent. Bigger, brasher and wittier than the original, this is improbable meta-humour at its finest, while Robert Z’Dar’s Matt Cordell takes comic book brutality to a whole new level. Acerbic exploitation that is a joy to behold. 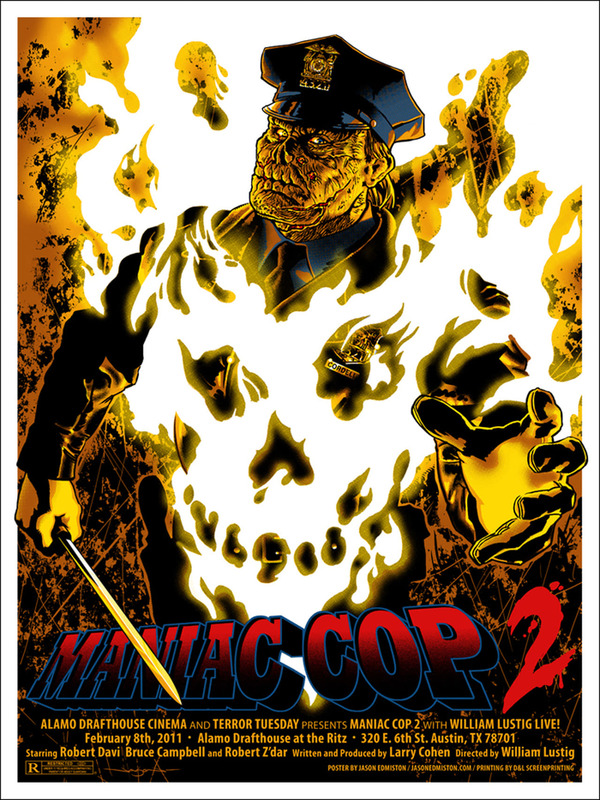 The thing for me was that I cared about the main characters in “Maniac Cop” 1 & 2, even if ultimately they were doomed, and I agree that Cordell was sypathetic, almg with being an imposing and fearsome presence. Overall, I think both films really get the formula right and I feel are worth checking out for both body count and characterization.